Lyric® Wild Bird Food mixes and straights have been specially formulated and designed to attract the widest variety of wild birds to your backyard. The always fresh, filler-free foods are great sources of nutrition and energy. Lyric Straights include proven bird feeding staples such as black oil sunflower, sunflower kernels, safflower and nyjer seed. 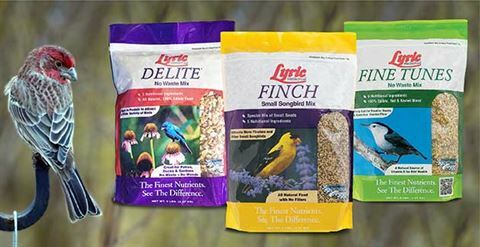 Lyric Mixes feature hand-crafted, premium quality ingredients to attract an assortment of wild birds. Fill your bird feeders with Lyric® Wild Bird Food and you’re sure to decorate your backyard with beautiful sights and sounds. To order wild bird food online or find a local retail dealer, visit the Lyric® Wild Bird Food website.